When Brits started going abroad on package holidays it was to the Alpine lakes, following the 19th Century ‘grand tourists’. Today, Italy’s Como, Maggiore, Garda and tiny Iseo are ideal family destinations, with boating, beaches, cable car rides to mountain highs and footpaths to explore, plus easy access to Verona, Padua and Milan. Few destinations are more beautiful, relaxing and easy to explore than the Italian Lakes. We feature holidays to no fewer than six of the lakes, each of them offering a unique appeal and atmosphere. We also offer an outstanding range of hand-picked accommodation options. In northern Italy, Lake Como is perhaps the best known and most popular with its grand lakeside hotels surrounded by majestic mountains. The ferry service is perfect for hopping from one waterfront gem to another, with such evocative names as Bellagio, Menaggio and Tremezzo. Our three- and four-star hotels are mostly on the lakeside. 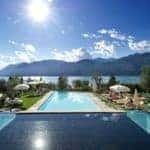 Lake Garda is no less scenic and we have a wide selection of hotels and some self-catering apartments, ideal for families, in Lake Garda North and in the South. Visit the nearby vineyards of Valpolicella or Bardolino, or simply soak up the bustling atmosphere of Garda itself – home to some of the best ice-cream we’ve ever found in Italy! 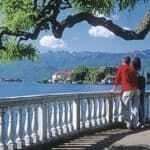 Stylish Stresa and elegant Baveno are our pick of the resorts around Lake Maggiore and a boat ride to the idyllic Borromean Islands is a must. If you’re looking to completely escape the crowds, how about charming Lake Iseo, one of the quieter options amongst the northern Lakes? If you prefer somewhere further from the beaten track, we recommend Lake Trasimeno in Umbria, close to the Tuscan border. Explore medieval walled towns, a stunning National Park and cool off in the lake itself. Transfer times from airports are short, there’s no need to hire a car as local transport is so good and, whichever lake you choose, you have so much to explore right on your doorstep. Click here for more about Inghams Italy holidays in the Italian Lakes. Find the best time to visit the Italian Lakes.